U2: 360° At The Rose Bowl was the penultimate gig of last year's U2360° tour in support of their Grammy-nominated album "No Line on The Horizon". The Rose Bowl performance was the band's biggest show of 2009 and U2's biggest ever US show, with a live audience in excess of 97,000. The show was also streamed across seven continents via YouTube. The first ever live streaming of a full-length stadium concert, U2: 360° at the Rose Bowl had over 10 million views on the channel in one week. 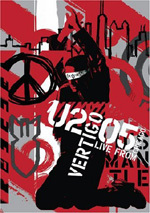 Shot entirely in HD, the concert was filmed with 27 cameras and directed by Tom Krueger who had previously worked on U23D, the first live action 3D concert movie taken from U2's "Vertigo" Tour. Available in standard and two disc deluxe DVD formats, U2: 360° At The Rose Bowl will also be U2's first concert available in Blu-ray. 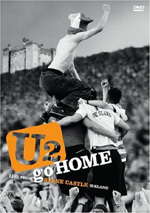 The deluxe formats and the Blu-ray will feature a new documentary called "Squaring the Circle: Creating U2360°", with new interviews from U2, Paul McGuinness and the team behind the touring production. When U2: 360° at the Rose Bowl hit the shelves in early June 2010, it seemed intended to advertise the summer/fall leg of their tour. U2 already played about four months of shows in 2009, and they planned on another four months or so in summer/fall 2010. Unfortunately, Bono hurt his back and required emergency surgery. So long, summer US tour – see you in 2011, folks! As I write this in mid-June, the late summer/fall European dates are still on, but that could change. I was going to see six more concerts in addition to the 10 I took in last year, but I guess I’m stuck until 2011. Oh well – at least I can content myself with 360° on Blu-ray until then. Shot at the band’s October 25, 2009 show at LA’s massive Rose Bowl. How massive? It drew a crowd of 97,000-plus, which makes it the biggest US audience for a non-festival/multiple headliner concert ever. The Blu-ray includes the entire Rose Bowl concert, though for reasons unknown, it relegates the opening song – “Breathe” – to the disc’s bonus materials. Instead, it launches with the performance’s second number and then proceeds through the remaining 22 tracks in order. As expected, 2009’s No Line on the Horizon receives the most attention. It provides seven numbers: the title track, “Breathe”, “Get On Your Boots”, “Magnificent”, “Unknown Caller”, “I’ll Go Crazy If I Don’t Go Crazy Tonight” and “Moment of Surrender”. The rest of the show offers songs from across U2’s career, though various usual suspects get the most play. 1980’s Boy and 1981’s October receive no attention, while 1983’s War provides “Sunday Bloody Sunday”. We find the title tune and “MLK” from 1984’s Unforgettable Fire, while 1987’s mega-smash Joshua Tree contributes “I Still Haven’t Found What I’m Looking For”, “Where the Streets Have No Name”, and “With or Without You”. We skip 1988’s Rattle and Hum and leap toward 1991’s hugely successful Achtung Baby and its four numbers: “Mysterious Ways”, “Until the End of the World”, “One” and “Ultra Violet (Light My Way)”. 1993’s Zooropa and 1997’s Pop fail to make a showing here, but 2000’s All That You Can’t Leave Behind offers “Beautiful Day”, “Elevation”, “Stuck In a Moment You Can’t Get Out Of”, “In a Little While” and “Walk On”. Finally, from 2004’s How to Dismantle an Atomic Bomb we get “Vertigo” and “City of Blinding Lights”. Surprising omissions? The biggest surprise comes from the absence of “Pride (In the Name of Love)”, as it’d appeared at all of the band’s shows over the prior eight years. Indeed, though it went missing for much of the 2001 tour, it’d been a pretty constant presence ever since its release in 1984. U2 played it at the North American tour’s opening show in Chicago but dropped it the next night; I don’t believe it ever returned. I’m not happy that U2 essentially boils down the 80s to equal Joshua Tree and the 90s equals Achtung, but I can’t say those choices surprise me, especially in terms of the omission of Zooropa and Pop tracks. The band seems to regard those as mistakes, and they’ve barely touched either album since the 1990s. Too bad, as both – especially the vastly underrated Pop - include good material. Despite the various omissions, I think 360° presents a pretty well-balanced set. Sure, I could live without some of the more tired warhorses like “Still Haven’t Found”, “With or Without You” or “Beautiful Day”, but I know that when a band plays a stadium, they need to include the big hits. Indeed, I respect the ambition U2 displays via the inclusion of so many No Line tracks and a few less-known numbers like “Ultraviolet” and “Unforgettable Fire”. Heck, they even broke out the Passengers obscurity “Your Blue Room” at some shows! Without question, “Ultraviolet” offered the biggest bone thrown to fans; it’s a fave of many, and it hadn’t appeared live since 1993. “Unforgettable Fire” was another good semi-obscurity for the punters, and both of these songs work very well in the 360° context. They get lively staging that suits them well; they’re probably my favorite moments of the concert. Much of the attention heaped on the 360° tour relates to its stage. The band dubbed the trek “360°” because it was the first-ever stadium tour to sell virtually all of the venue’s seats. Normally, a stadium concert loses all the side/rear stage seats because the set-up blocks them. You could sell those spots but no one would be able to see anything. 360° uses a four-legged monstrosity that allows for seats next to and behind the stage. Yes, the legs make some views obstructed, but the set-up still works. For the 10 shows I saw in 2009, seven plopped me on the general admission standing room floor. For the other three, I sat side/rear stage, and those tickets were pretty decent – for a stadium. At least they were reasonably priced and virtually as good as the much more expensive seats with a more traditional view; my behind the stage tickets were $95, while the better seats – that weren’t much closer to the action – went for $250. I’m happy that U2 found a way to make side/rear stage seats viable in a stadium setting. While the “Claw” functions well as a way to permit a stadium show in the round, it doesn’t really do much otherwise. Maybe that’s not a bad thing, as U2 probably didn’t want a stage that constantly distracted viewers from the band. Nonetheless, I couldn’t help but think that the “Claw” was a bit of a dud. The band develops this well-publicized set-up that really does little more than act as a lighting rig and a video monitor. I’m not saying the “Claw” needed to breakdance or shoot fire, but it simply feels like a bit of a missed opportunity. As for the band themselves, they sound just fine. Bono’s had some serious vocal ups and downs over the last decade-plus, and I know some fans slagged his singing in 2009. All I can say is that I thought he sounded better than he had in quite a while. Sure, he hit the occasional bum note, but he displayed greater consistency than any other time in recent memory. 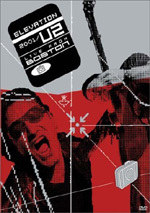 Over 12 2009 shows I witnessed – if you count the Rock Hall concert in NYC and this Blu-ray – I heard a lot of Bono, and I thought he sounded better than he had in a long time. As a tour, 360° fits well with its 21st century predecessors in 2001 and 2005. Obviously I love U2’s live performances; in addition to my 11 shows in 2009, I went to 18 in 2005 and 14 in 2001. Nonetheless, I think the band’s best live shows came in the 1990s, as both the Zoo TV and PopMart tours were simply outstanding. The 21st concerts have been very, very good, but they lack the dazzle involved back in the 90s. Perhaps that’s one reason 360° became a mild disappointment to me. I thought it’d restore the stadium extravagance of the two 1990s tours, but instead, it often just feels like the 2000s arena shows on a bigger scale. This isn’t a bad thing, and clearly I enjoyed it, but it means that 360° never wowed me as much as I’d like. Such are the breaks when you’re one of the world’s best live acts, I suppose! How does 360° present that live band? That’s up for grabs. I’ve read some complaints about the concert’s editing, and I do think it relies a bit too heavily on quick-cutting. However, when compared with siblings like 2001’s Elevation and 2005’s Vertigo, 360° appears nearly sedate. Those predecessors went with a hyperactive style that didn't bother me tremendously, but I prefer a more subdued examination. No, I wouldn’t call the editing of 360° restrained, but it avoids the excesses of its predecessors and usually lets us focus pretty well on the band. A band I look forward to seeing again next year. Until then, I have a pretty good concert representation to watch via U2: 360° at the Rose Bowl. 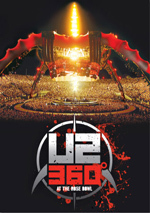 U2: 360° at the Rose Bowl appears in an aspect ratio of approximately :1 on this Blu-Ray Disc. A mixed bag, the disc provided erratic visuals. Much of 360° looked great. The disc often exhibited terrific definition, but too many lapses occurred. Some of the softness appeared connected to visual choices, but some made less sense. The instances of softness became an occasional distraction that affected my impression of the product as a whole. Light examples of jagged edges occurred, but I noticed no shimmering or edge enhancement. Source flaws were absent, but I thought some light artifacting popped up along the way. That sometimes made the product a bit grainy, though some of this was an intentional filmmaking choice. Colors were inconsistent – again, this largely seemed to stem from photographic decision-making. Like most rock concerts, the majority of the show’s hues stemmed from lighting; the stage lights and the effects from the “Claw” gave us most of the vivid tones. Unfortunately, these tended to be rendered drab by the director’s decisions. Many of the colors turn bland and desaturated throughout the show. Brighter tones do emerge, but they lacked the vivacity I expected based on having seen the concert so many times. Blacks were reasonably dark and tight, while shadows worked fine. Like the rest of the presentation, that side of things was erratic. Some of the low-light shots appeared clear, while others were murkier. Overall, much of 360° looked very good, but its inconsistencies left it as a “B-“ transfer. I felt less satisfied with the disappointing DTS-HD MA 5.1 soundtrack. My complaints stem almost entirely from the quality of the mix. The multichannel track focused heavily on vocals and guitar, which meant that drums and bass got stuck way in the background. Heck, much of the time, Adam’s bass was just a rumor, and Larry’s drums lacked the presence they deserved. This meant a lot of Edge and Bono, which I don’t mind in the abstract, but it meant a terribly unbalanced – and rather metallic – soundtrack. The mix was midrange heavy, without distinct highs or deep lows. Again, this related to the concentration on guitar and vocals, but it left the multichannel track as less than stellar. I had no complaints about the soundscape, though, as it fit the live setting. Instrumentation spread well across the front, and the surrounds offered good reinforcement. The back speakers gave the songs a nice sense of stadium ambience, and they threw in the expected crowd noise. The soundfield didn’t reinvent any wheels, but it made sense for the material. Unfortunately, the quality of the audio sent me running to the disc’s PCM stereo track instead. That one wasn’t amazing, but it showed much better reproduction of the music. It’s simply a better mix, as it boasted a stronger balance of the instruments. There’s actual low-end to be heard here, and vocals/guitars don’t overwhelm. Skip the mediocre DTS-HD track and go with the stereo one instead. We find a pretty decent set of supplements here. These open with a documentary called Squaring the Circle: Creating U2360°. During the 34-minute, 43-second show, we hear from all four band members, manager Paul McGuinness, show designer/director Willie Williams, show architect Mark Fisher, sound director Joe O’Herlihy, promoter Arthur Fogel, show consultant Gavin Friday, screen concept and design Frederic Opsomer, creative team member Catherine Owens, production director Jake Berry, tour director Craig Evans, and live concert director Tom Krueger. “Circle” mostly concentrates on the design and execution of the massive “Claw” stage as well as other aspects of the production. It occasionally threatens to become a bit dry, but it never falls into that trap. Instead, it offers an engaging, informative look at how this massive show came into existence. Under U2 360° Tour Clips, we get eight snippets. These include “Welcome to Milano! Milan” (2:31), “The Spotlighter: Barcelona” (1:34), “Dublin Awaits: Dublin” (4:42), “Edge Backstage at the Rose Bowl” (1:24), “Aung San Suu Kyi: Dublin” (3:14), “The North American Launch: Chicago” (2:38), “CN Tower Toronto” (1:28), and “Red and White: Poland” (1:08). These essentially fall into the “tour diary” mode, but most are a waste of time. “Milan” focused on some street artist who sings U2 songs badly, and “Dublin” does little more than show a lot of fans who traveled there for the show. “Backstage” is funny, and we get a few decent concert shots, but most of these pieces aren’t compelling. The disc’s interface doesn’t help. You can’t run them in “Play All” mode, and when one ends, you get sent back to the main menu, not the special features menu. This makes it a hassle to go through all the components. Bizarrely presented as a Bonus Track, the concert-opening “Breathe” shows up here. It uses the same kind of photography and editing as the main program, though it lacks audio options beyond simple stereo. I’m glad the song appears, but I remain annoyed that it’s not part of the full concert. I’m also unhappy it leaves out the band’s entrance; it starts with Larry on-stage and omits the build-up to that point. Next we discover some location-specific elements. Berlin Time Lapse (4:09) shows the concert from stage assembly to take down and gives us a cool look at the work that goes into that side of things. European and North American Tour Openings (7:03 and 10:02, respectively) fall into the “tour diary” category again, as they show before/during aspects of the concert. Because I attended the Chicago show, I’m happy to have some excerpts from it, but neither piece offers a lot of interesting footage. In addition to a 24-page booklet of photos and credits, the package ends with some promotional material. We find four music videos. These cover “Get On Your Boots” (3:25), “Magnificent” (4:25), “I’ll Go Crazy If I Don’t Go Crazy Tonight” (4:14) and “I’ll Go Crazy If I Don’t Go Crazy Tonight (Live)” (3:49). U2 have made some very good videos over the years, but these don’t live up to those standards – well, except for the first “Crazy”. It’s an animated piece that tells a little story; it fares pretty nicely. We also get Making of featurettes for “Boots” (2:12) and “Magnificent” (5:25). In addition to the band members, we get some notes from director Alex Courtes during the “Boots” piece; “Magnificent” simply shows footage from the shoot. “Boots” exists mostly to promote the then-upcoming tour, so it’s not especially fascinating. (I’m also not happy Adam disparages the actually-pretty-great PopMart tour.) “Magnificent” doesn’t offer a lot because it lacks any details; it's almost an alternate video, as it shows behind the scenes snippets set to the song. We don’t learn anything. After 30 years, U2 continue to produce quality work, and their concerts still deliver the goods. 360° at the Rose Bowl offers a fairly solid documentation of the band’s current tour; it could use better editing and shot choices, but I can’t complain too much. The Blu-ray presents generally positive visuals and a few interesting extras. The multichannel audio disappoints, but the stereo mix satisfies. I can’t call this a slam-dunk concert release, but it satisfies me.